Toppings- Shredded cheddar cheese, sour cream, tortilla strips, chives. Brown beef in a medium/large dutch oven over medium high heat. I like to season my beef with a little salt, pepper, and garlic powder as it is cooking. Once the beef is browned, throw kidney beans, black beans, and corn in with the beef and cook for a few minutes until the beans and corn soften a little ( about 3-5 minutes). Turn heat down to medium/low and add v8 juice, taco seasoning, tomato paste and peanut butter, stir together. If the peanut butter scares you, just add a little more tomato paste to help thicken the chili, about 1/2 a tablespoon or so. 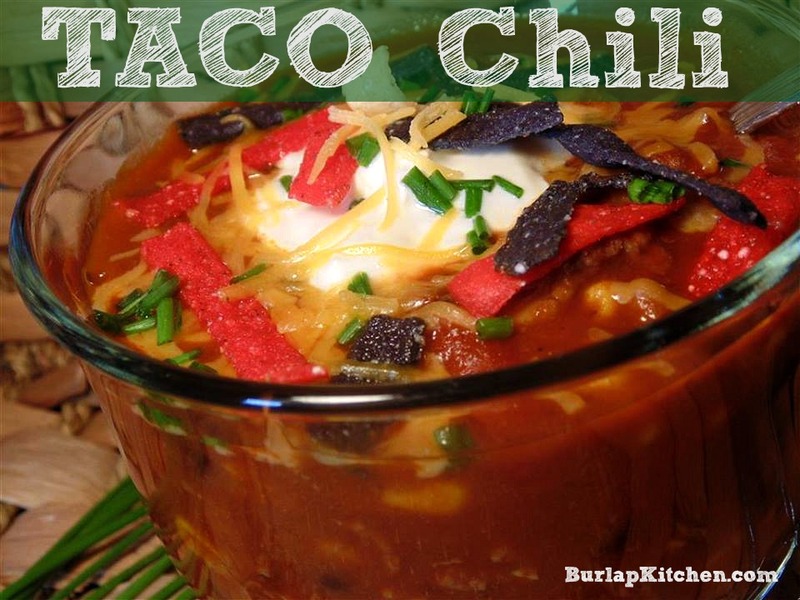 Turn heat back up to medium high and bring chili to a boil, once chili starts to boil set heat on medium and let chili simmer for 30-45 minutes or until chili has thickened and beans are soft, stirring occasionally. Serve in a bowl and load it up with cheese, sour cream, tortilla strips and chives! yum! top with: cheese, sour cream tortilla strips, & chives!